The price of Bitcoin has jumped up nearly 10 percent in the past two days. I'm eyeing two astrological factors. 1. 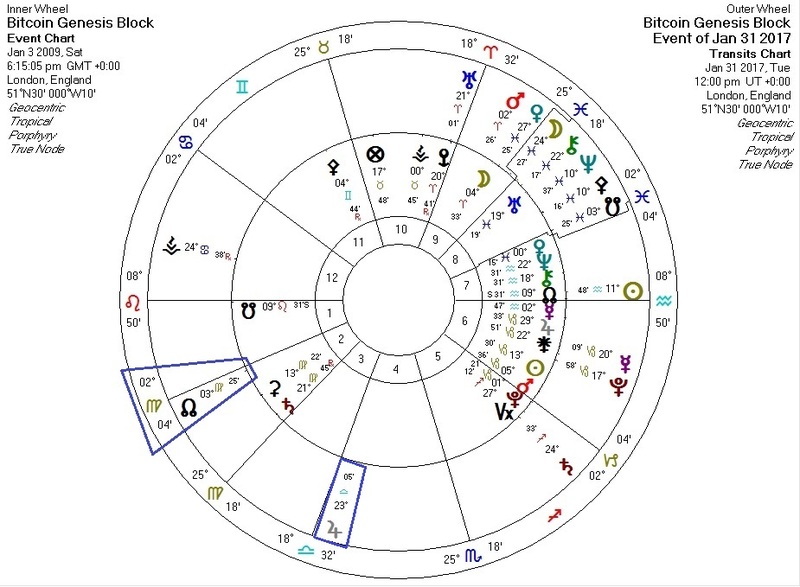 Jupiter is about to station retrograde this weekend, and it is currently conjunct Bitcoin's IC and trine Bitcoin's Neptune, ruler of Bitcoin's Venus. Might this week's price jump be a prologue to another "spike and crash" centered on this event? 2. The transiting North Node has started a two month stay on Bitcoin's Second House Cusp. This vector might mean relative highs or even price growth for a couple of months. We'll just have to see if anything happens this weekend.